Once upon a time, I was a Girl Scout. It was, oh, 1984 or 1985 when the troop I belonged to made these gift ornaments. This particular one was made by me for my parent’s Christmas tree. So yeah, this little guy is close to 30 years old. Many years later, when I had my own family, my mom let me take ornaments that were special to me for our tree and it became part of my family’s collection. This little gift has always been extra special, not just because I made it when I was a child, but because I remember very clearly understanding what the poem meant. Giving a handmade, heartfelt gift was a very potent and powerful thing because it was something I could do, a gift I could give without spending money or being able to drive or having a job or any of those other “grown up” things. This has remained so for me during my entire life. The love inside that tiny parcel is absolutely and completely real. Just hold the box close to your heart. Do you have special ornaments or decorations that bring back memories for you? I’d love to see: feel free to leave photo and blog links in comments! This entry was posted in Christmas, Holidays and tagged christmas craft, christmas gift ornament, christmas ornament on December 19, 2013 by Jennifer Ofenstein. My daughter has special needs and is a Girl Scout Ambassador. She is going to make this for her leader who she has been with since she started scouting as a Junior. She loves her like a mother and she is one of the few people I trust with my daughter. This is beautiful. Thank you! You’re very welcome, Julia! See you Saturday. 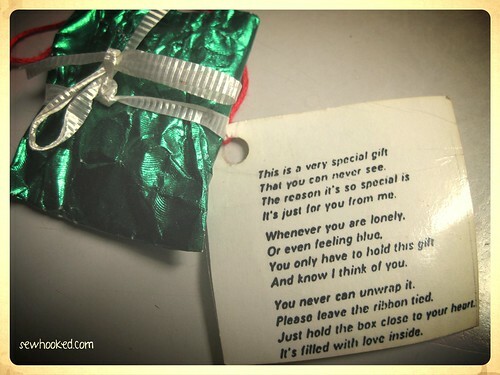 I have had this wrapped gift with the poem on it for many years. The children that gave it to me are now parents with their own children. It is the first package put under my tree every year! Jennifer, The ornament and poem are precious. I will try this with my grandson. Thanks for sharing!